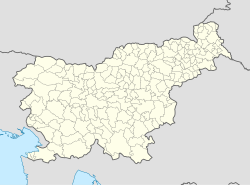 Artiče (pronounced [aɾˈtiːtʃɛ]; German: Artitsch bei Rann) is a settlement in the Municipality of Brežice in eastern Slovenia. It lies in the hills north of the town of Brežice. The area was traditionally part of Styria. It is now included in the Lower Sava Statistical Region. The parish church in the settlement is dedicated to the Holy Spirit and belongs to the Roman Catholic Diocese of Celje. It was originally built in the late 16th century, but was remodelled in the early 20th century. ^ Leksikon občin kraljestev in dežel zastopanih v državnem zboru, vol. 4: Štajersko. 1904. Vienna: C. Kr. Dvorna in Državna Tiskarna, p. 6. This article about the Municipality of Brežice in Slovenia is a stub. You can help Wikipedia by expanding it. This page was last edited on 12 March 2017, at 03:06 (UTC).